Actually, I am not too sure about the translation into English — this is another ‘Bing’ recipe with corn flour, or maybe it can be called ‘corn flour bread’ or ‘corn flour pancake’ in English? If you mention this corn flour flatbread in China, many many Chinese people from older generations would tell you many stories — after all, this is the kind of food that accompanied them during poorer days, and left them with plenty of memories. I heard these stories from my grandparents and my parents. When food was scarce, having something to fill up one’s stomach became the most important thing. 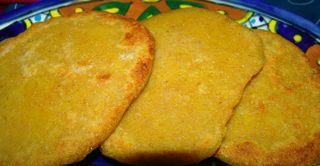 Having fine rice and flour was like a luxury dream out of most people’s reach, so this corn flour flatbread became their happiness. They said they used to think corn flour was one of the most delicious things, they could even taste the corn’s sweetness in it. However, as life conditions got better and better, it became almost impossible to find corn flour in large cities. My grandparents and my parents told me that I should treasure the comfortable life we have now, it seemed we surely left corn flour behind. So I never really had chance to try it, well, not until my second year in university. All second year art students in my university had to visit country side to practice life landscape painting skills. We picked up a small village by the sea side as the destination. It was a very beautiful and quite place with nice sea front views and green mountains behind us. It was very special particularly for us, who grew up in the busy cities, rarely had chance to experience other kind of life. However, after the excitement was gone, we still had a few weeks left. We were still enjoying our stay, but the problem was it was too far away from anywhere, which made it very difficult to find different varieties of food. After wandering around, we discovered two places. One was a morning market; we needed a lift from the locals, and it would take at least half an hour to arrive there; another was the local fisherman’s houses, see if they could sell us something. So that was the first time I ever tried corn flour flatbread. I remember I was quite emotional after having heard so many old stories. I even bought some back for my mum. Nowadays, as I mentioned in another post, having this kind of food becomes ‘trendy’ again, my parents’ generation like to have them to recall their old days, but for most of us, it is just a healthy choice. Many even have it as part of their ‘weight control’ diet. I started making it myself only in recent years, I did not know that corn flour is a popular ingredient here in UK, and all those delicious Mexican recipes. However, corn flour here is a bit different to the one in China. Chinese corn flour is more finely grind, it is more like normal flour. If you can get the very good quality corn flour, you can even taste a bit ‘sweet’ from the original corn, so there are many Chinese recipes with corn flour as ‘sweet cake’. Anyway, this is how I made it, one of the most basic ones — so easy to prepare. 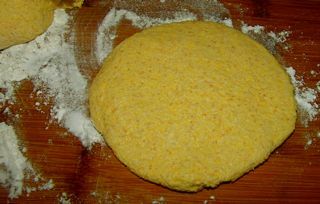 1) Mix corn flour and plain flour with yeast and warm water together into a good dough. (I used 3 cups of corn flour, 1 cup of plain flour and 6gm of yeast, 1 1/4 cup of warm water). 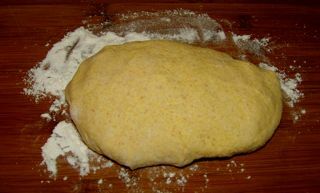 2) Leave the dough to rise. 4) In the heated flat sauce pan, pour in 1 tablespoon of oil, make it evenly spread in the sauce pan. 5) When the sauce pan and oil is hot enough, place prepared thin corn flour bread dough into the sauce pan.